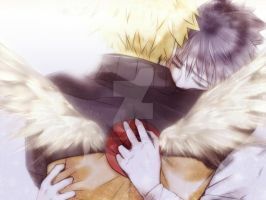 Lets all live in "Naruto and Sasuke are married happily ever after" -land! Foreverrrr!!! My ship, always and forever. I'm still in the denial stage. -touches picture- This is the true ending for me. No prob~! Ee btw im so glad you made an instagram! I didn't want to at first cause I'm super shy about my sketches haha! Omg but the hand sketches were so gorgous srslyy! !